We’re back to our regularly scheduled programming this week as far as the weather is concerned. Cool and dry conditions today will give way to warm and slightly humid conditions by Friday before a cold front brings some drier air in for a warm and dry weekend next weekend. The only chance for precip will be some showers on Friday. Today’s forecast worked out quite well. Morning rain moved out right on time and by 8:30 or so even the easternmost reaches of the midcoast were dry. Clearing quickly followed, as forecast, and temps rose into the 60’s and 70’s, also as forecast. 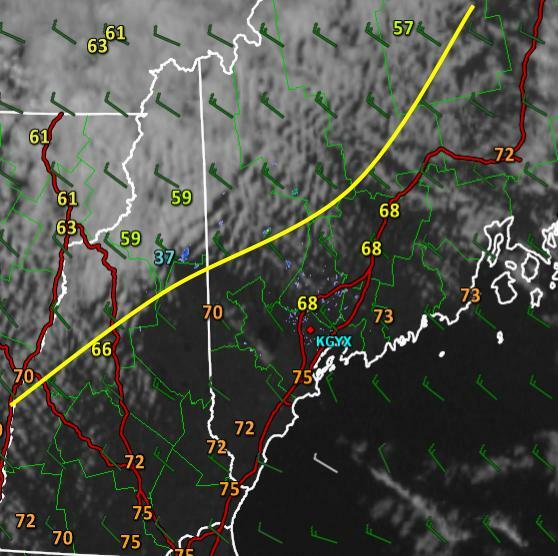 The upslope/downslope pattern I talked about this morning is clearly visible on the satellite imagery this afternoon with clouds over the mountains and sun along the coast. The one mistake on the forecast was to overestimate temps in Northern NH. Areas under the clouds barely made it to 60 and spent most of the day in the 50’s which was a bit cooler than I thought. 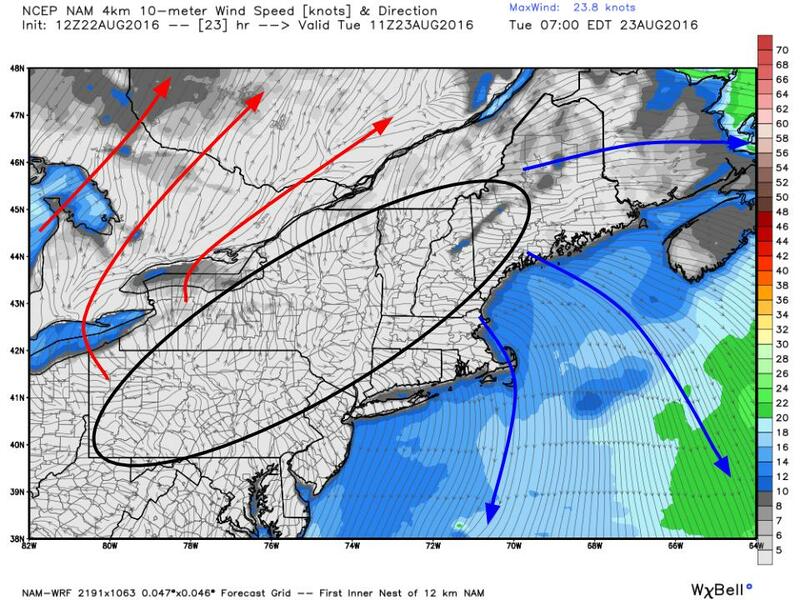 High pressure will slip just to our south (black circle) tonight as the cool winds of today prepare to give way to the warm breezes of tomorrow. In between, there won’t be any wind and as a result, temps will fall into the 40’s for most tonight with some 50’s across the south and east. Some of the most sheltered mountain valleys could see temps right around or even a little below 40. Radiational cooling does wonders! Warm and dry conditions are expected for tomorrow with highs generally in the 70’s. Temps will increase a couple of degrees each day from tomorrow through Friday and dew points will do the same. By the end of the week, we’ll have warm and sticky conditions but a far cry from the downright stifling weather of a couple weeks ago. Highs are expected to top out in the 80’s with dew points in the 60’s on Thursday and Friday before drier air works in for the weekend. 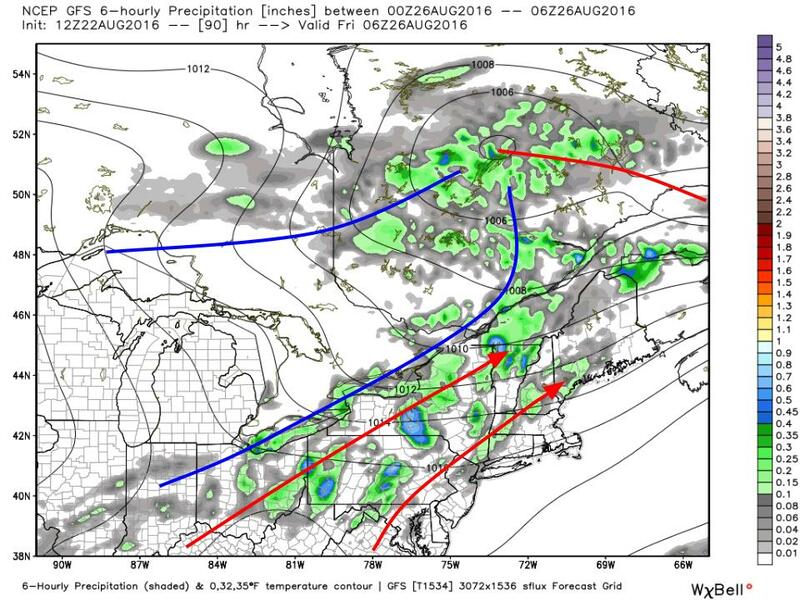 That drier air will filter in behind a cold front that moves through on Friday bringing with it some scattered showers. No significant rainfall is expected in the next 7-10 days. After the front on Friday, warm and dry weather is expected to continue through next weekend and into early next week. The tropics continue to heat up. To keep tabs on what’s happening down south, check out the new tropical weather page. It will be updated before 6:00 this evening with my latest forecast.